My Favorite Trading Strategy for the "Super Crash"
Markets are at an all-time high with the Dow in striking range of 20,000, but not every stock is rising with the tide. Earnings reports have been coming in for the last week, and that is not a good thing for these debt-laden companies struggling to stay afloat. With 2016 quickly coming to a close, positioning yourself for huge profits in 2017 is a top priority for investors. With earnings reports for 2016 due in the first quarter of 2017, now is the time to make moves, and we've compiled a list of top stocks to short now to get in before the crowds. Despite large gains in the stock market this quarter, one of the worst stocks on the market today just dropped 9% in a single day, and it's not finished. The big question on investors' minds is how do you profit from such a large drop in stock price? One of the best stocks to short has lost over 40% year to date. Many investors are looking for shorts to take to position themselves for profits in 2017. Focusing exclusively on the best companies means bypassing half the market's profit potential. A lot of folks - especially individual investors - don't like to bet on stocks that are going down. That's understandable. It doesn't feel as good to bet against something. But it would be prudent for investors to hedge their gains of the last five years; trees don't grow to the sky, especially when their roots are rotting. The bond market crash in Europe is inevitable, which means that banks and financial institutions will tumble too. There's not a better opportunity to make money short-selling. You could walk away with a bundles of cash. How did George Soros break the Bank of England? How did he predict the downfall of the pound? Was he an investing genius or an evil money-hungry cash pirate? For those of you don't even know the story, then that's up to you to decide. But one thing's for sure: On Sept. 16, 1992, he gave the Bank of England a run for their money. 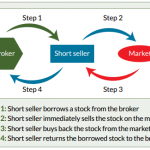 Shorting a stock involves selling borrowed shares, buying them back at a later date, and returning them to the borrower. A successful short seller will make a profit if they are able to buy back the borrowed shares at a price lower than what they initially sold it. It's certainly possible to reel in profits from a stock market correction - if you know the right strategies to employ. Good thing we do! In fact, there is one technique we'd like to share with you today - it's simple to use and great for reaping fast rewards. Today we've got three iconic stocks to short that aren't identifiable to everyone. Because there's only one reliable metric investors can use to recognize these seemingly pristine companies. And our timing couldn't be better, since corporate profit growth is about to go negative and fears of another recession mount. We may still be in a bull market, but the ground is becoming more fertile for short selling. At some point, the market is going to catch on as to why the markets have been surging so high for so long - years of money-printing by the world's central banks. That means now is a great time to look for short selling candidates. The mantra of "buy low, sell high" works for going long - but investors can make money from both sides of the trade if they understand these tips for short selling. Even in today's five-year bull market you can be rewarded handsomely through short selling. You can do this with currencies, exchange-traded funds, equities, and just about any asset.